Advantages: Superb photo coverage, well researched text, excellent artwork. The Duel Monarchy had a very tough and reliable fighter when it came to the Phönix D types. 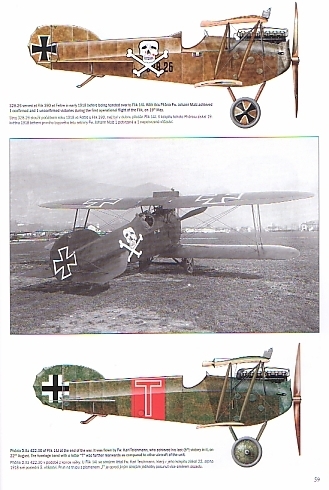 According to one report, the D.I was faster than the Albatros D.III (Oef) in both climb and air speed. The Aviatik D.I didn’t fair much better with it being inferior when comparing flight characteristics. Many of the leading Austro-Hungarian aces achieved victories in these aircraft, and the later Phönix D.III also went on to serve the Swedish Army Air Force after the war. 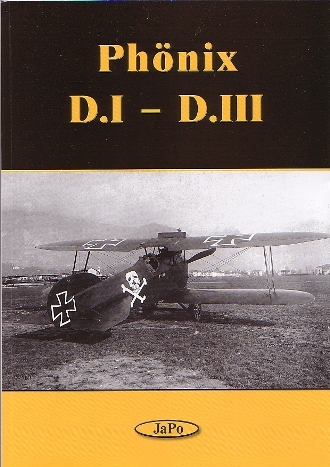 Although titled as Phönix D.I to D.III, JaPo’s latest offering also touches on the D.IV. It comes in the usual soft cover format and extends to eighty jam-packed pages. The text is all in English, and despite the difficulty of the subject, the high-quality translation presents no problems to the reader. There are captions though that are also done in Czech. The book is a treasure trove of images and one finds 124 black and white photographs, countless ones of which will be new to the reader. They are very well printed although there are always a few tantalizing pieces that one wishes were reproduced a little bit larger. Obviously space limitations have to take precedence here. Side views are presented for three of the prototypes (20.16, 20.18, and 20.30) with more expanded general arrangement drawings being done for the production machines. Types covered are the expected D.I, D.II/IIa and D.III but a surprise appearance is put in by the prototype D.IVs. One sad omission to the above was the lack of any under surface views. A handy table of measurements is presented at the end of these drawings that compare everything from wing gap to landing gear track. Here one finds an interesting length difference between the D.I and others in the series. This corrects previous published information and the reason for the change is fully explained in the text. A useful reconstruction based around a Phönix D.I cockpit interior gives the reader a good idea how this area was set out. An associated table below it describes all the items concerned. The first chapter of the book covers the history of the Phönix Flugzeugwerke A.G. followed by a description of the development of this series of fighter. A technical explanation of the aircraft follows which takes each part of the airframe and explains it in more detail. Further sections describe the Phönix in combat, including with the K.u.K Kriegsmarine. After the war, the D.III served with Sweden while the Czechoslovak air force tried to do the same with confiscated D.I and D.II aircraft. The latter eventually abandoned the idea. A fascinating chapter on camouflage is included which expands to cover the Unit and personal markings. JaPo Publishing has produced the most complete book on this series of fighter so far. The amount of information the authors have gathered is staggering and adds much to the knowledge of this often neglected fighter.